Bumper Knights ($1.00) is a bit of an oddity. A top-down version of bumper cars (supporting up to four players locally) with springboard walls and very light RPG elements, coated in a medieval adventure frosting with a story so light, you don’t even know what’s going on or who’s who until you read the biography cards that you unlock upon completion. To start, you choose from four different adventurer types, split evenly among the sexes. Each comes with their own default weapon (a lance, axe, etc.). You can then set off on a pre-written quest, or christen your own. In theory, that adventure then becomes ‘your adventure’ in the naming, with a procedurally-generated layout and enemy spawns. I say ‘in theory’, as your quest takes you through several forest, town, and castle-themed rooms, most of which were reused during the three different quests I saw through to the end. Combat is somewhat simplistic, but fun, using momentum (think of winding up a toy) to launch your hero around the room, striking enemies and ricocheting off walls and objects in the environment. Enemies combat you in the same manner. Some have more powerful weapons and attacks than your hero (such as a health-draining freeze spell), so there is a bit of strategy involved in taking down multiple foes and dodging their retaliatory stabs. There’s also some added variables in the form of powerups. These drop randomly, and offer health refills or the possibility of a stronger weapon. Bumper Knights is anything but difficult, though, and you can easily press start on a second controller to continue the fight as another adventurer, should you need to. You’re not missing much, as each character gets the same stock animation ending. It’s that same simplicity in design and the short attention span of its quests (funny one-liners galore) that derails Bumper Knights’ completely-metaphorical tire-wrapped vehicle. It might’ve fared better with a more-involved combat system and plot, or additional environments. As is, twenty minutes of bumping into people with swords and spears does not a good adventure make. Man, calling your game an RPG used to mean something. Androgynous party members, high-fashion battle-attire, 80-hour hairstyles… er, main quests, and mostly melodramatic storylines that nevertheless gave you a reason to Fira and Dia your way through literally thousands of fights. Not recently. With the exception of Penny Arcade 3, every other XBLIG RPG covered here (which, yes, now comprises a grand total of 3) has suffered the same non-story fate. Battlepaths (80 MSP) lumps itself together with that crowd, though with the distinction of being mechanically-sound and far more customizable than most. Your name changes depending on your starting stat preference, but the hero always looks like a step above Neanderthal. Villages are under constant threat from Orcs, Skeletons, and your typical RPG villains. The world is large (three huge areas, accessed once a certain quest is completed) and vibrant, but not very emotive. Don’t expect long chats. Fighting is turn-based, fast, and seamless. You look like you’re bumper car-ing into foes (BRPG). And that combat is more or less a miniature war of attrition multiplied several times over; just thumbstick-mash in the direction of your target. Don’t fight outside your weight class, don’t get surrounded or suckered by ranged attacks, carry potions or a regenerative spell, and you’ll generally be okay (penalties for death aren’t severe). Though with that ease, comes repetition. What nixes that tedium and makes for a more interesting formula is the idea of acquiring loot, then better loot, then epic loot. Combat and dungeon crawling are redeemed entirely with the chance to find top-notch stuff, and Battlepaths gets that part right. Every treasure chest and enemy drop is a chance to raise your standing in the world. A higher-rated armor piece or weapon isn’t necessarily the obvious choice either; like Torchlight, it’s all about stat-boosts and modifiers. Leveling up is equally inclusive. You are as lethal or as guarded as you want to play. There is some backtracking if you’re not careful. Without a map, you can get lost, though the game does a serviceable job of pointing you in the right direction. Which is part of the problem. Complete a quest, pick up another quest, bumper car through it, loot some, and repeat. The overarching storyline is there isn’t really one. Which is a shame. Beneath the gorgeous art and well-done RPG aspects is a shallow series of missions that never escalate the conflict (whatever it is) into anything resembling a must-play. Desert… Pyramid… Ah, I see what you did there. And that’s okay. To be clear, Battlepaths is far from a bad game. I’m fine with it. I liked it. It takes some time to get going, and the story never does, but if you love your loot and level grinding (Me! and… Me! ), you can stamp that ticket here. At 80 MSP, you get a respectable RPG-like to sink an estimated 20+ hours (whoa, and with additional challenge rooms, whoa…) into. How many of those 20 hours are memorable, though, will fluctuate from player to player. If you’re one of those people that believes in and bases their existence around absolutes, then it’s probably safer for the both of us if I refer to RotoSchutzen (80 MSP) henceforth as a ‘mini-game’, rather than a full product. That is what it is, in actuality, a half-game, not masquerading as one so much as it is gallingly so. Dropped onto a deserted (but lushly-illustrated) planet defended by turrets and mines, you (the little helicopter-box guy) set off in search of ‘the big button’ that you must push. All of that comes from the marketplace description, and that’s all you’re told for the duration of the game. Gameplay consists of you trading a barrage of shots with the resident turrets of varying size / shot pattern, and maneuvering around mines or steam traps. Occasionally you’ll hit switches to open up doors, tracing their wiring back to the source, then its back to the turrets. You’ll be forced into small caverns with a lot of enemies, resulting in death, though the checkpoint feature here is incredibly friendly, usually putting you within a few feet of where you met your end. The trailer says (or doesn’t say) it all. Though in flying over its green fields or through its steamy interior, there’s no implication of how you came to be here or what the planet is about. While the results of pushing ‘the big button’ are obvious enough, there’s no reason given for any of it. There’s no extras, no New Game+ or impetus to play through again, leaving you with a rather hollow victory. RotoSchutzen comes from creator Owen Deery, who by his own admission is focused on bringing polished but quick, one-off games (sorry, ‘mini-games’) to market. I’m not against that idea from the outset; if it works, and it’s full-featured or an arcade-type, why not? There doesn’t have to be a minimum timetable. But with something like Bytown Lumberjack (from this past March) or now with RotoSchutzen, you need a little more content or replayability if you hope to get gamers on board. 80 MSP ain’t a bad entry point, I agree, but I can’t recommend something that finishes in under an hour and exudes almost no personality during it. That’s the story of RotoSchutzen, regrettably. A good-looking game with well-oiled gears, just dressed up and given nowhere to go. If the developer adopts a new policy and throws his full weight behind an idea, I’ve no doubt it’ll be amazing. Just don’t look here for any of that promise. Monster King (80 MSP) marks the second JRPG I’m playing in as many weeks, Mortal Legacies (review) being the other. In a quick vote between the two titles, Monster King is the superior, though when taken against the whole of the indie RPG catalog, it falls somewhat short. As the eponymous hero, you’re told that monsters have besieged the lands of… somewhere. It’s never elaborated upon. You don’t get a proper name or any speaking lines. You’re just told to fight. It doesn’t matter if you’re personable, as you’re not accepting sidekick applications. The whole setup is bare-bones. In every way, you’re lone wolfing it in MK. Combat is of course turned-based, via the typical menu selections; Attack & Magic, use a potion, flee a battle. In a nice gesture, you automatically equip the best weapon and armor for the job, and shops in the various towns will only sell to you if its beneficial for you (a completely foreign concept in our reality). Exploration is minimal. Outside of potions or new weapons / armor found in scattered chests, there’s not much to see. Mostly you fight random battles in the field, covering ground until you reach a bridge or bottleneck, at which point you’ll take on a boss for the right to pass, then repeat. So long as you’re well-leveled, battles are fast, if uneventful, though there is an interesting wrinkle. MK subscribes to the theory that ‘Hokey religions and ancient weapons are no match for a good monster at your side’, enabling you to first weaken and then add the game’s monsters to your armament, Persona / Pokemon style. The idea works well in practice too, adding a degree of experimentation to fights despite the expected ‘try fire vs. ice, etc.’ checkmates. Given the high cost of some magic, it’s an effective option once you’ve learned each monster’s weakness. And though you’re not rewarded with anything for doing so, there is a strange sense of accomplishment once you’ve captured the lot of them. And that roster of creatures is diverse, if nothing else. Psychic rats. Brains in jars. 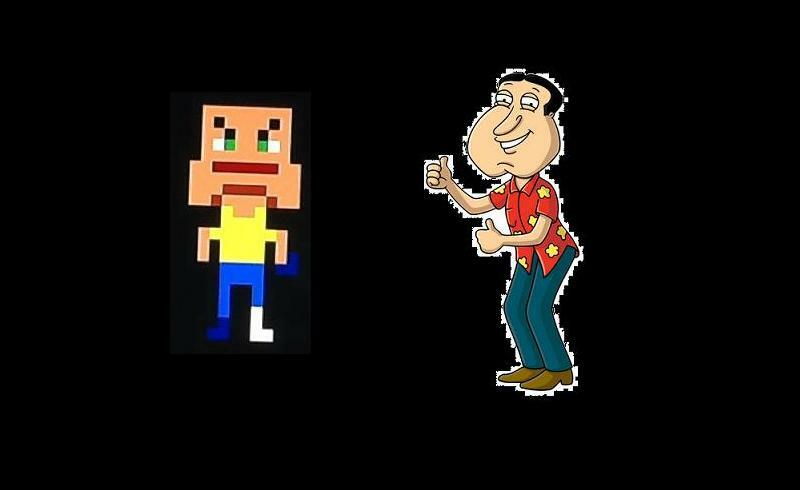 There’s a Tree Killer (doesn’t kill trees, oddly) that is timber with an uzi, and a Not Ready, which looks like a pixel Quagmire (maybe it’s the prominent jawline). That’s worth a chuckle, though some of them are duds (Snowman, blah. Hover Dude, really?). In terms of excitement there isn’t much, a few hours of old-school monster-slaying, but I found it charming. Grinding out progression, one character level and one stat increase at a time, evoked Dragon Quest for me (the first monster, Sludge, is an easy stand-in for a Slime). Nostalgia is a factor, sure, and it’s an innocuous RPG without much of a story (till the very end), but it moves swiftly and doesn’t overstay its welcome. Despite the allure of the bigger-budgeted, Hollywood-visuals RPGs, there’s plenty of market space left for independent role-players to set up pixelized shop. The Breath of Death / Cthulhu one-two, EvilQuest, and the upcoming Penny Arcade 3 are all good examples of indie development gone right. And while they can’t ever hope to match the look and scope of a retail release, I’m here to say they can beat the big guys at their own game, with quirky, original stories and / or characters that strike some chord with the player. It’s all about ideas. 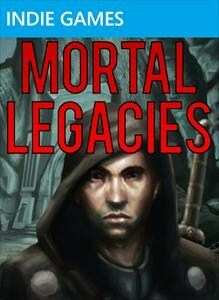 Mortal Legacies‘ (80 MSP) box art (looks a bit like Desmond from Assassin’s Creed, doesn’t it?) seems to tease a darker, more modern take on old school turn-based JRPGs, though the truth is much duller. Assuming the role of blue-haired Valloc, you’re given a fateful directive (from your Mom, of all people), to explore the land of Elisia in search of the King’s lost crown and prevent the shadow from engulfing the world. Not that the world much pleads its case for salvation. It’s as bland as they come, and nobody has much to say to about it. From townspeople to party members, a sentence’s worth of exposition about does it. All the castle’s guards communicate via the Skyrim meme, which has seen enough use but to me never gets old. What does get old is the combat. I realize the turn-based system is inherent to retro role-players, but here the random battles tend to come back to back a little too frequently, and you’ll constantly buff and restock those allies in your group with spells / attacks that hit multiple enemies, just to get the damn battle over with rather than necessity. Casting Devastating Blow? Yeah, to Fun. The game is too linear and too short to set up a decent plot or characters, with party members that fill every RPG support role stereotype (mage, rogue, priest), and have zero personality, backstory, or reason to be there. Same too for the quests and objectives. It’s all stuff you’ve seen / done previously (pirates, bandits, oh my). You also level up at an incredible clip; on medium difficulty, it’s nearly every other fight. I’m sure good intentions were there (making it easier to pick up and play, and thus, more enjoyable), but the lack of proper balance favors the player in almost every battle, leaving the endgame devoid of any challenge or joy. The game’s brevity (hour+) is therefore a blessing. Beating the game unlocks a new mode that turns Valloc into a demon (no explanation given, and the narrative doesn’t change). With the weapon and armor you’re able to then equip, you’re over-powered from the start, which just highlights the game’s balance problems even more. There’s no need to go on. With the absolute barest of character-building and story-telling frameworks in place, a cumbersome inventory, and frequent, protracted fights, it’s no surprise that Mortal Legacies is a completely skippable experience.